Baby #3 is well on his/her way. Sorry for the creepy ultrasound picture…but it’s the law of blogging-you-are-pregnant…you must share the ultrasound picture. I’m trying to jump out of my color comfort zone…but it might be a mistake. I’ll show you even if it is…unless it’s really bad. Happy news, congrats to you! That's wonderful! Congratulations to you and your family!! Congratulations!! Three is a lot of fun! For me, the adjustment to the third was surprisingly easier than adjusting to two, so I'm hoping the same is true for you! Congrats!!! As a mom of three I can tell you it is crazy and awesome and everything in between. How Exciting! A BIG congratulations to you and yours! Congrats! And who gets sick of cake?!! Congrats! Exciting news :) My dear friend has 3 April babies – it makes for a really fun month! Congratulations! Can't wait to hear more. Congratulations!!! Wonderful news! :) Our family's always sick of cake in July and September… four people's birthdays each of those months! hey congratulations allison! i'm due march 14 so i'm right there with ya. hope you're feeling ok.
will you find out baby's gender? i'm taking a poll on my blog – we never find out but i kinda want to this time … hmmm! Woo hoo! Congratulations! Here's to lots of cake! Congrats! Speaking as the mom of 3, it's totally awesome! Congratulations. At our house we had 3 birthdays in July and one in June, all within 31 days. Got it all out of the way in the summer. Congrats! My Siblings and I are all September babies with me finishing up the month of celebration. My little one was born March 13th this year. Yes, the ultrasound pics is a must lol! Congratulations!! Threes the charm!! Love the picture…someday your child will laugh at that! Take care! Congratulations to you and your family! Hope you have a smooth pregnancy! Congratulations! And those pictures are so cool! Makes it so much more "real" somehow doesn't it? i love creepy ultrasound pictures! Congratulations! What wonderful news! Congratulations to the 5 of you :) Here's to many beautiful baby quilts! Congratulations, this will be a special baby. Wahoooo! Congratulations! What a blessing! Congrats! I remember being pregnant with #3 as a bit overwhelming (two little children to take care of), but his babyhood was wonderful (two little helpers to fetch, carry, and clean up!) I am glad it is you and not me, as I have had six, and the youngest is now 16 (but I also run a daycare of eleven children!!) Take good care of yourself!! You know that only you can, and your whole family is depending on you. Best wishes! Congratulations! How fun to have a larger family! Here's to a safe and uneventful pregnancy! Congratulations on #3! Babies are such a blessing. Do you wait until the birth to find out the gender? three is a great number, I had a boy then two girls just 18 mo apart. My youngest daughter just had her first, a boy and two girls, TRIPLETS! It is a bit overwhelming right now but will be oh so much fun in a year or so! Congratulations to you and your family. I have 3 and it's wonderful. Many blessings to you. Congrats! I was looking forward to a March baby at this time last year and now have a sweet six-month-old sleeping in her crib. We have two March kids now so it'll be a party month! Congratulations! Both my babies were born in June with 5days between. I have almost finished my sons quilt he is three months now, just sewing the last of the binding. Yay! Congratulations! You'll be ready (or have to be) when he/she is born! Are you feeling well? Congratulations! Being a mum of three myself I'm a huge supporter of the three-child family! It's tiring but lots of fun! Wishing you a very happy pregnancy! Congratulations Allison, three is a nice number!! Congratulations, Allison! This is wonderful news! Hope it's smooth sailing all the way to March! I'm one of 7 – my oldest bro is Oct (honeymoon! ), I'm Feb, the other 5 are ALL March…..yep! Fun! Congrats to you and the family !!! Congratultions to you all! Seems to be something in the blogging waters! I really want three or four kids, more the merrier, right?! Congratulations Allison!!! I am thrilled for you and your growing family. Isn't it amazing the age we live in when we can SEE our baby growing!!! How amazing is that? I wish you more delights and joy than you ever thought your heart could hold!!! Congratulations to you and your family! What a wonderful time March will be. Congratulations!!! Hope everything goes well and you are feeling good!! From my experience, the first 2 kids are the hardest, #3 and #4 (you probly don't want to think about that) were much easier to get used to. You're already in the routine and have all the baby stuff you need, and depending on the ages of the others, you can get at least a little help from them. Looking forward to seeing your "out of your comfort zone color" quilt! Parabéns!!!!!!!!!!!!!!!!!!! três é uma boa conta, felicidades aos cinco!!!!!! Congrats to you! 3 babies is a good number. Can't wait to see the quilt! Congratulations!!!! March is a good month, as you already know! Congratulations!!! I'm due in March with baby #2. I hope you are feeling well. I've got my fabrics pulled and an idea what I want to do, but I'm haven't found the motivation to actually start a quilt for this little one. Can't wait to see what you make!! I love creepy ultrasounds, it just highlights how special babies are and how amazing the whole process is. Congratulations! My daughter's birthday is in March, so when my sons due date was March 1st my mom said you have to have him in February, so they don't have the same month for birthdays! He was born Feb. 28th! Congratulations!!! 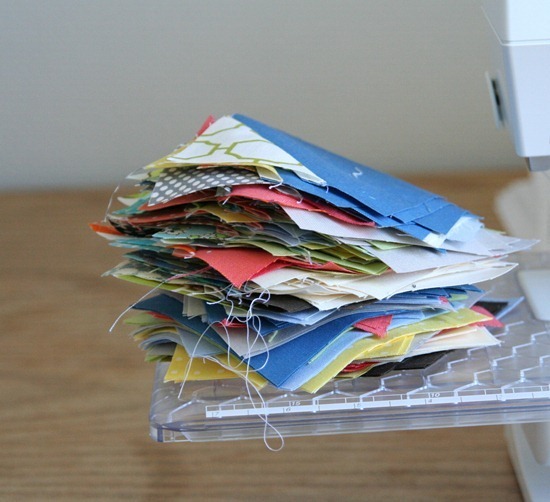 How exiting and surely you will sew baby quilts and baby cloths! Congratulations! the 3rd is the bonus! My best friend just found out she is pregnant with number 3 and she is 43! She is still in shock since she has a 3yr. and an 13 month old. I say better in your 40's than not at all!!! Can't wait to see the new quilt! Congratulations! What wonderful news!!! Wishing you all the best! Congratulations! We added baby #3 to our family in May. Your little one will bring so much joy. Congrats to all of you! What a happy house you will have every March celebrating multiple birthdays. Again…Congrats! Congrats! We have three grown kids, all 18 months apart. Wouldn't want it any other way! She looks just like you! Of course I am kidding. My daughter is also due in March. Must be something in the water. Congratulations to you and your family, there is nothing like a new baby to remind you of what matters most! I am a mom of 9…and really after 3 i could of have kept on going and then reality hit and I realized that it was not just a baby, but it was 18 more years of raising kids and so we quit. That said, I loved those years and every other phase of mothering too…beware they go so fast and then they are gone. Congratulations, Allison! We have several March birthdays also. Hope you are feeling well and please show the quilt…your things are always great! Congratulations to you! My third child arrived last week. Things have definitely changed around here, but for the better. Of course starting out with twins kind of makes the third a little bit easier. ;) I hope the rest of your pregnancy goes well and I can't wait to see your quilt, I am sure it will be amazing! Congrats I am pregnant with my fifth and my due date is April 6. My fourth's due date was the 7th of April. So I could possibly have two kids with the exact birthday just three years a part- it'll be interesting to see what happens. All the best. What a blessing! My family has three January birthdays. So the holiday season just seems to run from Thanksgiving to February. Very sick of cake by then! Congratulations! I couldn't talk the husband into a third :( Send the leftover cake to my house! By the way, I love the peeks of color I see in your baby quilt beginnings. Congrats! I too have 3 birthdays in March and yes, you will be sick of cake by the end! It's fun though! Congratulations and it is NOT a creepy picture at all. Congratulations! It's a doddle 2/3 children, you're already in the zone so number 3 just fits right on in. We hardly noticed our third he just blended in with the rest of the chaos! And d'you know a more placid contented person I've yet to meet, so no worries (he's nearly 21 now)! congrats. Your last one isn't very old is he? We had 6 in 11 years. Good on you. Look forward to seeing the quilt. COngratulations! That is so exciting! 3. . . what an adventure! Encouragement from a perfect stranger: I found going from 2 to 3 kids WAY easier than going from 1 to 2. I totally love your site and your quilts and your voice. Congratulations on your growing family! Mazel Tov!!! How exciting……wishing you and your family so much joy!!! Congratulations!! Thanks for sharing the great news!! Praying everything goes well for you. Oh congrats! It will be wonderful once you get used to it! Congratulations!! 3 gets easier a little while later….afterwards….but it will!! Promise…one with 3 boys….it will! When I found out I was pregnant last time I was so happy and then I found out it would be a March bday and I cried our immediate family has 7!!! March birthdays!!!! No one looks forward to March or the weight loss after. CONGRATULATIONS ON YOUR BABY !!!!!!!!! Congratulations! I have three little ones as well, and I am so glad that we decided to have three. Our kids are born in March, April, and May. I think the Spring is a wonderful time for birthdays! Congrats! My first 3 are May babies and my last is April. It does make it a busy month to have so many birthdays in one month. Oh, our anniversary is in May also. So fun! Awww, congratulations! Wonderful news! I have always been sorry I didn't have #3. Congrats! I wish you every happiness and an enjoyable pregnancy too. Oh how exciting for you. That's funny you're stacking them all into one month of the year that way. My birthday is Jan 10th and my twins were born on Jan 15th. Congratulations! Thanks for sharing your happy news! Congrats!!! I have to say that going from 2 to 3 kids was easier than 1 to 2 for me! How exciting for you!!! Congratulations!! I have 3 kids with birthdays in September so we have just gotten through another year of birthdays:) It was good when they were younger though as we could just have a huge "combined" party but they don't want to do that anymore. Congratulations on your pregnancy.I am also 4 months pregnant! I feel pretty tired and my job as school teacher spends almost all of my energy, so I have almost abandoned the patchwork. 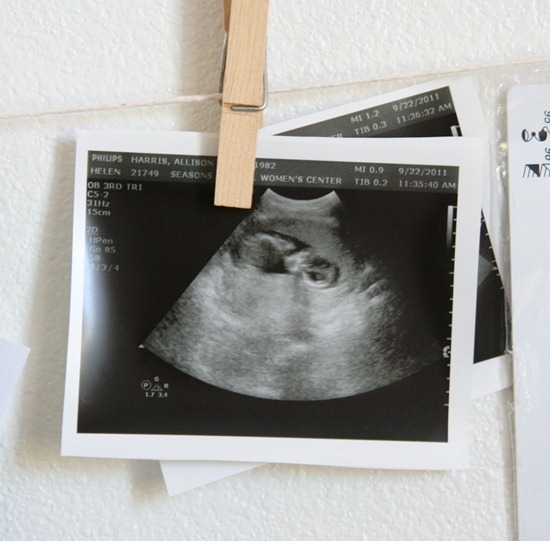 I loved seeing your ultrasound. I wish you a peaceful and happy pregnancy. Congrats…show us your quilt either way. If it's not to your liking send it to 100 quilts for kids. Congratulations! Babies are God's most precious blessings. Congratulations on baby #3! I'm super jealous… I've been trying to talk David into having another one for a year now. Please tell Jay to talk to him! LOL! Are you hoping for a boy or girl? How wonderful! Children are a great gift and a great adventure! I hope you are feeling okay? what big news~ your house will be the party house every March! Congratulations – March is a great month for birthdays! And I did the same thing, only with November. I have 3 in the first week. We're awfully sick of cake come the second week. I was not aware of the ultrasound posting law–noone tells me these things! :) I suppose I still have time though, my 1st is due in Jan. Congrats! hmmm, I just realized that the hubs bday is in feb, mine's St. Patty's day, so we'll have 3 months in a row of bdays! that is amazing news!! Congrats to ya!!! Congratulations! Not sure how I missed this post but so glad I decided to read back from your most recent post! Congratulations on baby #3! We have three and our two daughters each have three! Good things happen in threes! And I love seeing ultrasound photos so post away! Congratulations to you and your family!! That's so exciting! I just had our #3 in June and it hasn't been as much harder than having 2 as I expected – still an adjustment, but not as bad – I had another boy though, and I've heard girls can be a bit more of a handful. Best wishes! Can't wait to see what you do with the quilt – regardless! Congratulations!!! Always so exciting to find out about a new baby! In my family, we have 7 birthdays in September! Soooo fun, so crazy and SO MUCH CAKE!! Happy, healthy wishes for you and that new baby!! Congratulations. I had my 3 sons all in June. Get all the Birthdays over in one month. congrats! my first and only child (at least so far) was born this March 19th and in our country this is also Father's day, so it's double party! i hope all goes well in your pregnancy! yeiii for March babies! You are amazing, but don't feel guilty taking it easy when you need to. You deserve it.